Home » Beauty Tips » A Natural Remedy For Hair Loss? For most men and women, hair loss is an embarrassing and sensitive issue. It is also a condition that affects far more people than is generally known, afflicting even young teenagers in extreme cases. Fortunately, there are several hair loss treatments that are both safe and effective, and equally importantly they are natural and don’t pose the risks associated with using drugs. People who live a natural lifestyle mainly stick to using natural treatments as much as possible, since these are usually easy to find and can be used without worrying about the known side-effects when using chemical-based types of hair loss treatment such as Propecia and Minoxidil. For men, the most common type of hair loss is known medically as hereditary alopecia or androgenic alopecia which means it is usually inherited and more common in men – hence its common name of male pattern baldness. When suffering from this condition, the hair begins to thin on the crown and temples and is usually replaced by a more wispy, downy type of hair. Women tend to suffer from a variation of hereditary alopecia known as female pattern baldness, which often strikes after going through the menopause. More worrying for women is the fact that female hair loss is on the increase, and in some cases it may even be self-inflicted all in the name of beauty. Some well known causes of hair loss in women are hormonal and related to pregnancy, menopause and thyroid conditions. Birth control pills and HRT (hormone replacement therapy) can also cause temporary hair loss for some women. However, some experts also believe that too many hair treatments at salons can contribute towards hair loss, blaming regular perming, bleaching and dyeing. Give your hair a complete break from all forms of hair processing for a few months if you think this may be the cause of your hair loss. Researchers at the Department of Dermatology, Aberdeen in the United Kingdom conducted a 7 month study in 1998 showing certain essential oils could treat Alopecia areata successfully. Essential oils stimulate hair regrowth due to their ability to stimulate the tiny blood vessels of the scalp where the hair follicles are created. This stimulation helps to increase the blood flow which carries the nutrients so vital to the follicles. Here’s further information from one of our previous articles about using essential oils to treat hair loss. A study published in the Journal of Dermatology tested the effectiveness of onion juice on people with alopecia areata. Twenty-three people with alopecia areata applied the onion juice twice daily for two months, and 15 people applied a placebo (tap water) twice daily for two months. The results showed that 74% of those suffering from alopecia areata experienced significant hair regrowth, and within six weeks of using onion juice, 84% were reported to have hair regrowth. Simple scalp massage can really help reverse hair loss, and some treatments without the use of essential oils include coconut milk, almond oil, olive oil or aloe vera gel. Aloe vera is a plant known for thousands of years as a natural treatment for hair loss; it helps to balance the pH level of the scalp, cleans the hair follicles, and heals irritated skin. Applying the gel or liquid of this plant directly to the scalp is said to activate two of the enzymes in the body that are responsible for normal hair growth. To help increase blood flow in the scalp after a massage treatment, follow up with a shampoo containing essential oils, and finish with a cold water rinse. Reducing damage to hair during styling is an excellent way to prevent loss of hair. Reduce chemical treatments, heat styling, or the use of any harsh products as much as possible. Rosemary and sage herbs can be boiled together to make a stimulating rinse treatment that promotes hair growth. After steeping the herb, strain the mixture to remove the herbage use it as a final rinse after shampooing. This herb rinse helps to stimulate hair follicles back into production and end extended resting phases in the hair growth cycle. Rinsing hair with a mix of apple cider vinegar and sage tea is also said to aid hair growth. Likewise, henna is also claimed to help stimulate hair follicles and encourage hair regrowth. As henna seals the hair cuticle it makes hair stronger and more resistant to breakage and loss of shine. And finally, remember that some form of exercise is an important contributing factor if you are looking for a natural treatment for hair loss. Not only does exercise help fight stress (which is often a major contributing factor), but it also increases blood circulation and helps to improve the absorption of nutrients. Yoga is excellent for helping to relieve stress too, plus it stretches and relaxes muscles which also helps to increase your blood circulation. You can help to prevent further loss of hair and encourage hair re-growth by including dietary products with Omega 3 fatty acids. Include salmon, sardines, herring or mackerel in your diet two or three times a week, and try freshly ground flax seeds over salads or cereals. Flax seeds can be ground with a coffee grinder or blender and stored in the refrigerator for use throughout the week. Chickpeas are a great source of zinc and vitamin B6, and both of these elements are essential for hair growth and hair loss prevention. Zinc also works well with Vitamin A to prevent dandruff and hair loss. To use your essential oils in the fight against hair loss, simply add 5 drops of essential oil (in total) to every 10mls of carrier oil, shampoo or conditioner. For a shampoo treatment using essential oils try mixing a larger amount using 50 drops of essential oil to 100mls of a shampoo or conditioner base. 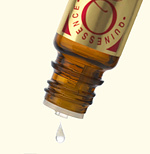 Shake to bottle vigorously to ensure that the oils mix in completely. For best results add your essential oils to Quinessence Professional Hair Care Bases and make your own luxurious and effective treatments.